“So, let’s get started with the Apple Watch,” said the bright-sneakered Tim Cook, delivering a quick fist-pump before the company unloaded all the details surrounding its latest and greatest smartwatch. Don’t get it twisted — Apple may have revamped its iPhone line in its annual September event, but the Apple Watch announcement was the takeaway. Sure, there’s now three notched phones for your to choose from instead of one, but the Series 4 reminded us of two key traits which have kept the aura flowing around the Apple logo since Steve Jobs returned to the company in 1997: innovation and design. We got the refreshed looks we wanted from last year’s Apple Watch Series 3, while Apple further exercised its medical credentials by installing an industry-first electrical heart rate sensor into the underside of its new watch. It means users can now more accurately receive heart rate monitoring, while Apple now has clearance from the FDA to help detect atrial fibrillation and low heart rate through an ECG reading. And we suspect that's just the start. The bigger display, new sizes and these new heart tracking capabilities — standing on top of the improved watchOS 5 — will mean Apple rules on as smartwatch king, that much is certain. Just as its competitors caught up in both design and functionality, the Cupertino giant put on the afterburners and said, "catch us if you can". But for all the positives we were witness to in the unveiling and our hands-on time, Apple still didn’t end the smartwatch debate during its keynote. And the question of the best smartwatch isn’t completely closed, despite the fact the Series 4 will undoubtedly become the new clubhouse leader. Why? 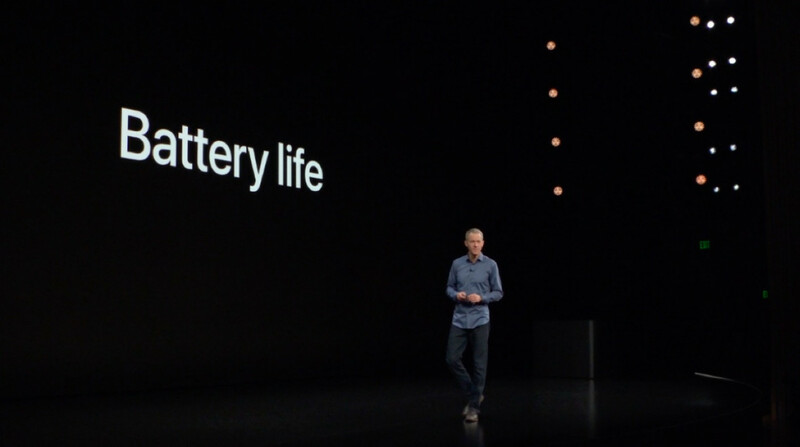 For a few small reasons, but mainly because of one elephant in the room — and that is that we’re still dealing with roughly the same battery life as we were when the Apple Watch was first announced over four years ago. And if there’s been one theme of smartwatches in 2018, it’s that the day-long rule of previous generations no longer applies.But for all the positives we were witness to in the unveiling and our hands-on time, Apple still didn’t truly end the smartwatch debate during its keynote. The question of the best smartwatch isn’t completely open-and-shut, despite the inevitability of the Series 4 becoming the new clubhouse leader. Take Apple’s biggest smartwatch rivals, Fitbit and Samsung. The former delivered the Versa back in March, which can stay alive around the clock for approximately four or five days, while Sammy’s new flagship, the Galaxy Watch, remains awake for up to a week. But, no, not the Series 4. Not even close. On one hand, it wasn’t overly surprising to see Apple stick with 18-hour battery life, considering all the engineering work it has done to cram in new features, more processing power and that electrical sensor into a fresh design, but it does mean that there’s still a legitimate reason to choose another smartwatch over the Series 4. While the introduction of ECG readings is an astounding technological feat — one that will save lives — it’s also reasonable to debate (as Wired’s Robbie Gonzalez does in this piece) whether the new feature can also be, at best, fairly useless for the majority of users, and, at worst, potentially damaging for others. But if you ask current Apple Watch users whether they could do with more battery life, there’s a very high chance they would all say yes. Because why not, right? Who doesn’t enjoy charging something less and being able to access it for longer periods? And it isn't simply about the convenience of charging less often, either. The Apple Watch’s day-long battery life is just that — long enough to take it off the charging puck in the morning, go for a run, listen to some music, and maybe make a phone call without your phone being present. By the time you’re ready for bed at the end of a long day, the Apple Watch is ready, too, to get back on charge. It wasn’t overly surprising to see Apple stick with 18-hour battery life... but it does mean that there’s still a legitimate reason to choose another smartwatch over the Series 4. That has its own obvious limitations, but a more crucial one is that it leaves Apple with no choice but to ignore a considerable element of the wider health monitoring equation it’s trying so desperately to conquer — sleep. The Apple Watch, through third party apps, does have the internal tech on board to track your sleep if you wish to, but this generally compromises your use the next day. And if you’re not prepared to take time out to boot things back up to a reasonable charge, it means you’re stuck with limited insights into your overall health. It's something we expected the company to rectify after acquiring Beddit back in March 2017, but so far that remains a partnership that has failed to bear any fruit. And with no hints for some time that the company is looking into sleep, it's fair to question which Apple Watch generation it, and Fitbit- and Samsung-level battery life, will come to. Apple unveiled the most mature and formidable wearable we've ever witnessed in the Steve Jobs Theatre, but it also left a considerable elephant in the room, and a reason for potential buyers to pass over it. Only time will tell if that truly comes to hurt its dominance. First, I am glad that Apple recognizes the issues of falling. That said, so much for fall detection. Once again the weakest link is the human interface and dependance on "wearing" a device. I’ve been toying with the idea of moving back to Apple from Android. I wear a Garmin vivoactive 3 at the mo. The Apple Watch has recently looked like it’s finally getting its fitness aspects together but 18 hour battery life... ... ... ... ... ... that is a complete face plant Apple.